When a Taskfeed Board is created, the user who created it is the Board Owner. The Board Owner can then add more people to collaborate on the Board. You can also give Board Team Members a role each on the Board. If Tasks have a role designated for them, team members are assigned to those tasks automatically. From the Taskfeed tab, click on the Board View . Click on the top right corner of the screen, to Add a Board Team Member. 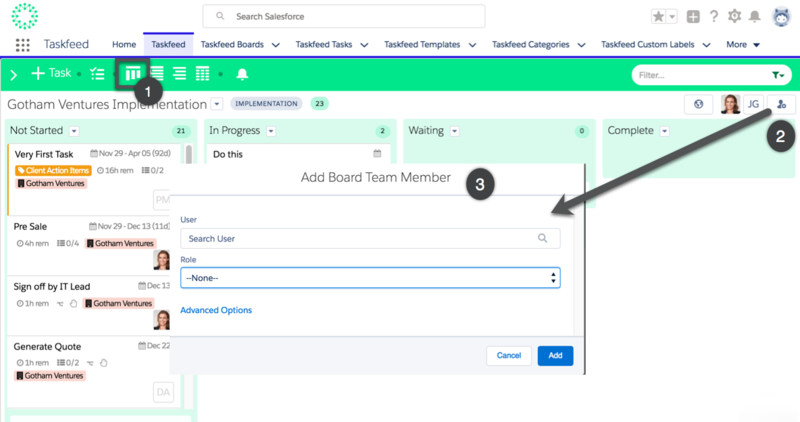 You can select a User from the lookup menu, or select a User and give them a Role from the drop-down menu, or simply add a Role to the Board, with no user selected. Click on their picture or initials at the top right corner of the Board. Select a member to Remove. Board owners cannot be removed from the Board. They must be reassigned separately. Remove the Board Team Member you wish to replace or reassign. Click to add a new Team Member to the Board. Give them the same Role as the member you removed in step 1 to add them to any open tasks defined for that role. The new team member will be added to the Board and assigned to any open (not completed) Tasks assigned to the previous member.